In the spring of 2010, the day before his high school graduation, Graham Wallace was playing basketball with friends and was struck with a ball in the head. “It wasn’t even hard,” he said. That afternoon during graduation practice, however, Wallace felt dizzy and light-headed and was taken to a local hospital. It was his fourth concussion, with the previous three all a result of playing soccer. Wallace sustained his first concussion in 5th grade during an indoor soccer tournament. During a routine save he bobbled the ball and an opposing player kneed him in the head. “One of my friends’ dads was taping the game so I’ve watched the hit—it was pretty nasty,” he said. Younger athletes are not only at a higher risk for concussions, there is evidence that they experience more severe symptoms than their older counterparts. High school soccer players performed worse on verbal, visual and memory Post-Concussion Assessments than college players. They also recovered at a slower rate. (The American Journal of Sports Medicine 2012) Additionally, female athletes performed worse on the visual Assessment and reported more symptoms than their male counterparts. In an effort to reduce concussions among young players, there has been a call by some to ban headers until players are old enough to have more developed brains and are skilled enough to properly execute headers. Dr. Bob Cantu, chairman of the surgery division and the director of sports medicine at Emerson Hospital in Concord, Massachusetts, has been cited by NBC Sports calling for a ban on heading for players 14-and-under. Eric Foster, an Alma College assistant coach and a former Alma College player himself, had his second concussion as a freshman at the Michigan school in 2008 (the first was not soccer related). The NCAA and individual universities have made it a point in recent years to make athletes more aware of concussion syndromes and long-term effects. Both DePaul University and Northwestern University display concussion policies and resources on their athletic department websites. The NCAA is now a driving force behind concussion awareness among young athletes. A “Concussions” menu is one of the six options within “Health and Safety” on the NCAA website. Within the site athletes can find additional concussion resources and news articles about concussion studies. Additionally, the NCAA has concussion posters for men and women to be posted in training facilities and locker rooms as well as a video for athlete awareness. Jeff Carrico, assistant director of sports medicine at DePaul, said in an email interview that the treatment of concussions by the school’s training staff has not changed. “The only thing that has changed is that we are obtaining more resources from organizations like the NCAA Health and Safety committee and the National Athletic Trainers Association on how to recognize, prevent, and care for concussions,” he wrote. FIFA, the international governing body of soccer, is also raising awareness for concussions while conducting research of its own. On its website it provides resources for concussion awareness among young athletes as well as a concussion cheat sheet for coaches and trainers. Among its own athletes, FIFA has conducted studies of both men’s and women’s competitions in order to identify causes of soccer concussion, potential gender disparity and the safety of heading a soccer ball. A study identified aerial challenges as the cause of more than half of soccer concussions, while saying that “the accelerations heading causes to the head of a player are below the level associated with brain injury.” (F-MARC) In other words, there is not enough force when heading a soccer ball to cause a concussion. The organization has made a rule change to help minimize concussions in international soccer. Prior to the 2006 World Cup it made an amendment to the Laws of the Game calling for red cards (an automatic ejection and loss of player for the team) in cases of elbowing to the head. FIFA reported fewer concussions in 2006 than in previous World Cups. FIFA also hosted a two-day concussion conference in Zurich, Switzerland on Oct. 30-31, 2012. FIFA was joined by the International Ice Hockey Federation, the International Olympic Committee and the International Rugby Board. Results of the conference will be published in the future. Likely the most famous soccer concussion of all-time happened on Oct. 14, 2006 to Chelsea FC (and Czech Republic national team) goalkeeper Petr Čech. In the first minute of the Chelsea/Reading FC match, Čech was kneed in the head by midfielder Stephen Hunt. When he made his return in January, Čech wore protective headgear to cushion future impact. While many studies doubt the value of soccer headgear for field players heading a ball, for an often defenseless goalkeeper the added protection has much more obvious value. After a 2011 game against Fulham (and another concussion), Čech told The Telegraph the helmet prevented a second serious brain injury. In 2011, Logan Pause of the Chicago Fire suffered a concussion on an unexpected header. In a Chicago Tribune article Pause said that it was not until after the game that he felt the effects of the concussion, “After the game and the next three days, I had some pretty bad headaches.” Like Čech, Pause returned from injury with a rugby-style helmet to offer him protection. In January 2012, Major League Soccer hosted a symposium for team athletic trainers and physicians to update concussion protocol. Changing the rules for re-entering a game after experiencing concussion-like symptoms will help prevent players from staying in a game like Pause after suffering a concussion. After his fourth concussion, Wallace also began to wear protective headgear at the request of his parents and doctors, as well as for his own safety. Over two years later and Wallace has just finished his third season playing varsity soccer at Division III Alma College in Michigan. Since he began wearing the headgear after his high school graduation he has not suffered another concussion. While evidence for the value of protective headgear has grown, there has not always support for the headgear. The U.S. Soccer Federation allows protective headgear, but does not endorse it. In fact, the Federation website has not updated its stance on headgear since 2005. Soccer officials also worry that endorsing headgear could hurt the future of the game. It could scare parents away from signing their children up to play. 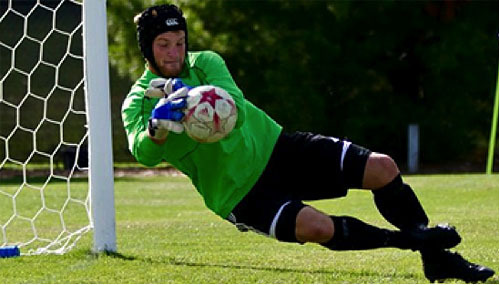 The headgear was originally thought to be protection from injuries caused during intentional heading of the ball, which has proved to be the least common cause of soccer concussions. Headgear has been proven to reduce impact of heading a soccer ball (Journal of Athletic Training 2003), but if that is not a primary cause of soccer concussions, then where is the value? There is now also evidence that shows that while intentionally heading of a soccer ball may not cause a concussion, the repetition of heading a ball may lead to concussion-like damage of brain cells. Researchers at Albert Einstein College of Medicine believe that the threshold for having evidence of brain damage appears to be between 1,000 and 1,500 headers per year—only a few headers per day. That study would make it appear that many competitive soccer players would be at risk for concussion-like brain damage. A reduction in the severity of the blows from headers by headgear could, in theory, change the threshold for number of headers that translates to brain damage. However, there has been no such research done. While recruiting, Foster said he sees three or more high school players per team wearing variations of the headgear. “In the MIAA (Alma’s conference) there are only maybe three other players wearing the headgear, but we have three including Graham,” he said. The use of headgear in soccer may not be fully endorsed by organizations such as the U.S. Soccer Federation or compulsory to wear like shin guards, but soccer—especially youth soccer—may be headed that way.